Nice Dolphin is the Captain of Big Waves and one of it's midfielders. He has golden yellow hair and teal eyes, he also is tall. He is nice and cares for his team deeply like most captains. 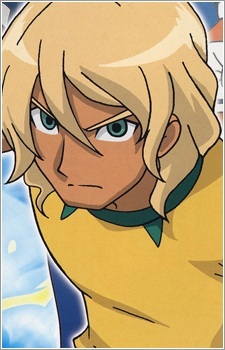 He appeared in the match Big Waves vs. Inazuma Japan. At first Inazuma Japan was having a hard time against Big Waves and their hissatsu tactic Box Lock Art Defense, but after everyone figured out how to break it, Inazuma Japan won.